Nothing is known about this operation except that it issued [undated] passenger fare tokens. The typical business pattern was common carrier scheduled omnibus service between railway station(s) and local hotels, coordinated with train arrivals and departures. Most such firms also engaged in charter activities, and some also carried mail. ( Atwood – Coffee p. 472). Incorporated 1911 (Dom.) CYB erroneously reports end of service 30 June 1930. (Mills 1967, photo: wellandhistory.ca). Operated by Metro Niagara Transit (a private company) with City funding 1973 - 31 December 1976. 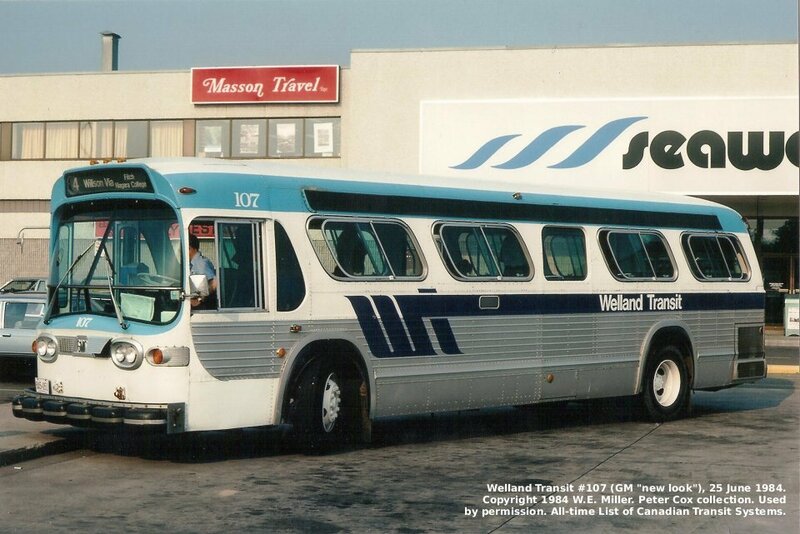 (Perera 1973 lists City of Welland Transit System). Became the contract operator for transit in Port Colborne 31 March 2008. Contract operator of transit service for Pelham 02 September 2008 – 31 August 2009. Responsible for certain Niagara Region Transit routes from 12 September 2011. ( Canadian Coach 1973, CUTA 1976-77, CUTA 1989, CUTA 1991/2, CUTA 1992, Chow 1998, photo: W.E. Miller [Peter Cox collection]). * RFC. CYB erroneously reports end of service 30 June 1930. Chow, Raymond, Welland Transit , a world wide web site at the url: http://www.freenet.hamilton.on.ca/~aa813/wellandtransit.html, 1998. Duncan, Paul, Niagara Regional Rail Spur web page at URL: "http://www.vaxxine.com/nrrs/h3.eht", 1997 http://www.niagararails.com/h3.html 2003.